Both parties currently are unpopular with the public, according to the most recent survey by the Pew Research Center. But as the GOP showed in 2010, a party with a low favorability rating can still score a sweeping victory in midterm elections. The survey, conducted July 17-21, found that just 33% of Americans have a favorable opinion of the Republican Party while 58% have an unfavorable view. 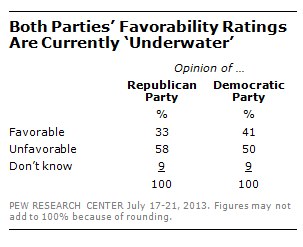 The Democratic Party is viewed more positively; still, unfavorable opinions (50%) outnumber favorable ones (41%). The GOP’s unpopularity is nothing new. Since 2005, its favorability ratings have never been in significantly positive territory. Yet the GOP’s less than sterling image did not prove to be an obstacle for the party in 2010, when it picked up 63 House seats. 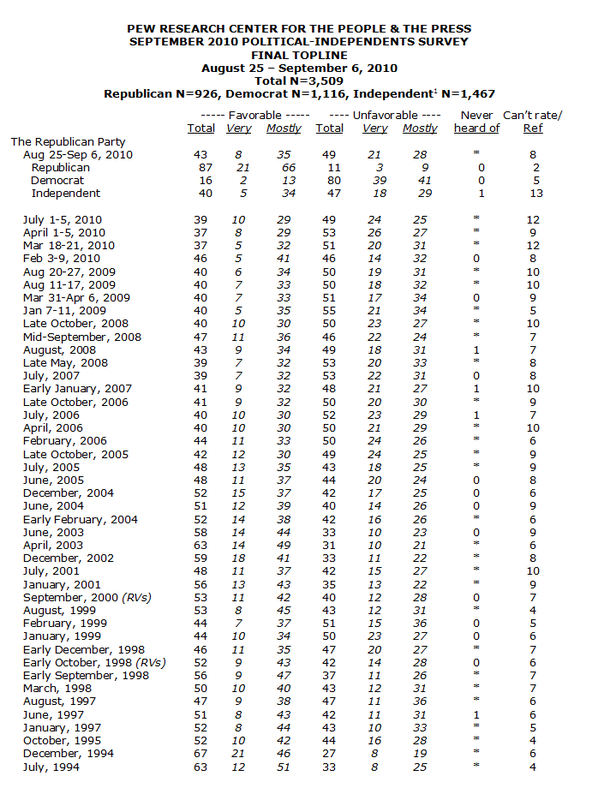 A Pew Research survey in September 2010 showed that 43% had a favorable opinion of the Republican Party, while 49% had an unfavorable impression. National exit polls found that, even as the GOP won a majority of House votes in November 2010, its image was still more negative than positive. That marked a change from midterms dating back to 1994 through 2006. In those elections, the party that gained House seats was viewed favorably. While the Democratic Party’s image is not as negative as the GOP’s, this month’s poll showed that the Democrats’ favorability rating is at its lowest in more than a year. As recently as June, the Democrats’ favorability rating was in positive territory (51% favorable vs. 45% unfavorable).